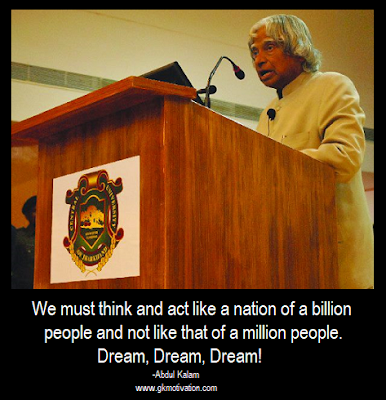 Avul Pakir Jainulabdeen Abdul Kalam was an Indian scientist who served as the 11th President of India. His father, fishermen used to rent the boat and Kalam home condition was not much better. He used to work selling newspapers and magazines to help your house members after coming back from school. His reading and despite not stop, he studies due to bereavement write and economic situation is not good also support completion of their house members in recognition of their hard work and dedication and made further studies. he was graduated in space science from Madras Institute with a technology in 1958. Subsequently, he was elected as a scientist in DRDO (Defence Research And Development Organisation) There he began his career by making a helicopter of the Indian Air Force, but by working in DRDO did not get satisfaction because there was a committee working on it. He wanted more. This was followed by the transfer ISRO (Indian Space Research Organization) in 1969. Meanwhile, he was elected as a satellite launch project director of India. In the completed project, he very well and then began to realize that I may make this work. A scientist by profession, he held a degree in aerospace engineering. 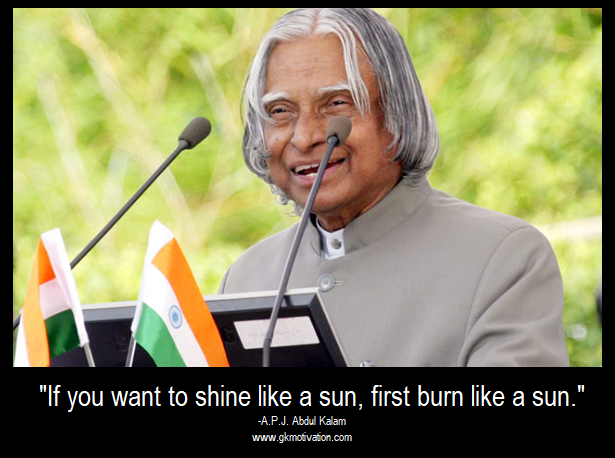 Renowned as ‘The Missile Man Of India’, his writings, books, lectures, thoughts, views and life have been a guiding light to generations and will remain so. A highly knowledgeable man with vast experiences in a varied number of fields, he was also a skilled writer. He authored several books, and loved children.
" Great dreams of great dreamers are always transcended." "We should not give up and we should not allow the problem to defeat us." " Man needs his difficulties because they are necessary to enjoy success." " Look at the sky. We are not alone. The whole universe is friendly to us and conspires only to give the best to those who dream and work." " Be more dedicated to making solid achievements than in running after swift but synthetic happiness." " Do we not realize that self respect comes with self reliance?" " Climbing to the top demands strength, whether it is to the top of Mount Everest or to the top of your career." 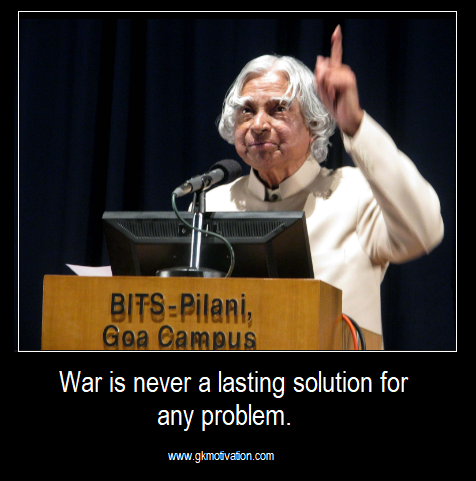 " Unless India stands up to the world, no one will respect us. In this world, fear has no place. Only strength respects strength." " Those who cannot work with their hearts achieve but a hollow, half-hearted success that breeds bitterness all around." "If you want to shine like a sun, first burn like a sun." " Small aim is a crime." "There are a number of women who have brought about immense change in society." "My 2020 vision for India is to transform it into a developed nation. That cannot be abstract; it is a lifeline." " The bird is powered by its own life and by its motivation." " Teaching is a very noble profession that shapes the character, caliber, and future of an individual. If the people remember me as a good teacher, that will be the biggest honour for me." " I was a disadvantaged child from a non-educated family, yet I had the advantage of being in the company of great teachers." " We should not give up and we should not allow the problem to defeat us." " Let us sacrifice our today so that our children can have a better tomorrow." " The wealth of information now available at the click of a finger amazes me." " Never stop fighting until you arrive at your destined place - that is, the unique you. Have an aim in life, continuously acquire knowledge, work hard, and have perseverance to realise the great life." " Where there is righteousness in the heart, there is harmony in the house; when there is harmony in the house, there is order in the nation; when there is order in the nation, there is peace in the world." " One of the very important characteristics of a student is to question. Let the students ask questions." " Life is a difficult game. You can win it only by retaining your birthright to be a person." " To succeed in your mission, you must have single-minded devotion to your goal." " For me, there is no such thing as a negative experience." " The President's post should not be politicised. Once a president is elected, he is above politics." " We must think and act like a nation of a billion people and not like that of a million people. Dream, dream, dream! " " For success of any mission, it is necessary to have creative leadership. Creative leadership is vital for government, non-governmental organisations as well as for industries." " It's when children are 15, 16 or 17 that they decide whether they want to be a doctor, an engineer, a politician or go to the Mars or moon. That is the time they start having a dream, and that's the time you can work on them. You can help them shape their dreams." " For me, there are two types of people: the young and the experienced." 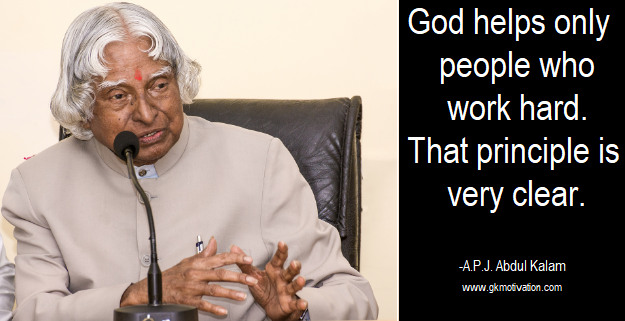 " You see, God helps only people who work hard. That principle is very clear. " " While children are struggling to be unique, the world around them is trying all means to make them look like everybody else. " " I'm not an expert on the arms race." " Science is global. Einstein's equation, E=mc2, has to reach everywhere. Science is a beautiful gift to humanity, we should not distort it. Science does not differentiate between multiple races. " " God, our Creator, has stored within our minds and personalities, great potential strength and ability. Prayer helps us tap and develop these powers. " " Writing is my love. If you love something, you find a lot of time. I write for two hours a day, usually starting at midnight; at times, I start at 11. " " The purpose of education is to make good human beings with skill and expertise... Enlightened human beings can be created by teachers." " War is never a lasting solution for any problem. " " Climbing to the top demands strength, whether it is to the top of Mount Everest or to the top of your career. " " Ultimately, education in its real sense is the pursuit of truth. It is an endless journey through knowledge and enlightenment. " " Creativity is the key to success in the future, and primary education is where teachers can bring creativity in children at that level. " " Excellence is a continuous process and not an accident. " " Let me define a leader. He must have vision and passion and not be afraid of any problem. Instead, he should know how to defeat it. Most importantly, he must work with integrity. " " A teacher should have a creative mind. " " When we tackle obstacles, we find hidden reserves of courage and resilience we did not know we had. 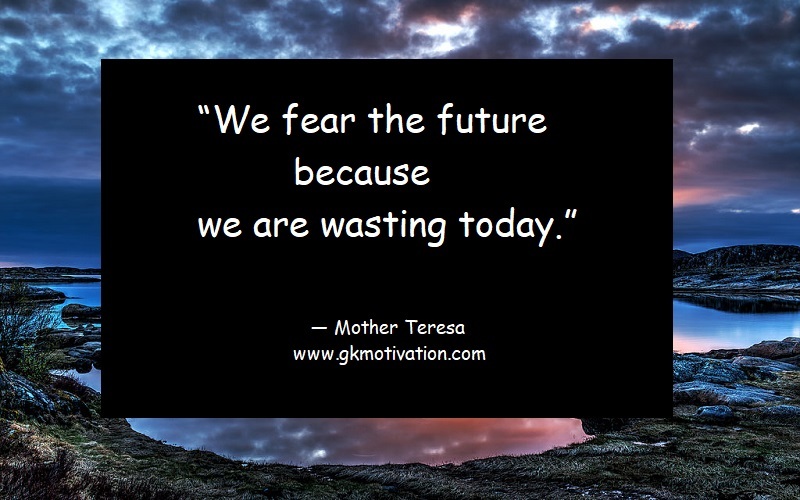 And it is only when we are faced with failure do we realise that these resources were always there within us. We only need to find them and move on with our lives. " " My message, especially to young people is to have courage to think differently, courage to invent, to travel the unexplored path, courage to discover the impossible and to conquer the problems and succeed. These are great qualities that they must work towards. This is my message to the young people. " " Real education enhances the dignity of a human being and increases his or her self-respect. If only the real sense of education could be realized by each individual and carried forward in every field of human activity, the world will be so much a better place to live in. " " Failure will never overtake me if my determination to succeed is strong enough. " " Don’t take rest after your first victory because if you fail in second, more lips are waiting to say that your first victory was just luck. " " All Birds find shelter during a rain. 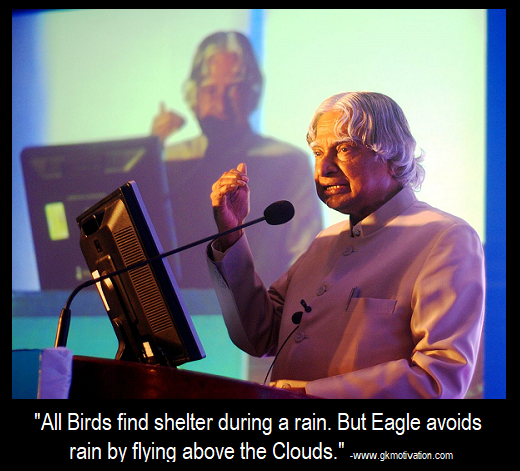 But Eagle avoids rain by flying above the Clouds." " Without your involvement you can’t succeed. With your involvement you can’t fail." " Don’t read success stories, you will only get a message. Read failure stories, you will get some ideas to get success." " Confidence and Hard-work is the best medicine to kill the disease called failure. It will make you a successful person." " It Is Very Easy To Defeat Someone, But It Is Very Hard To Win Someone." " Before God trusts you with success, you have to prove yourself humble enough to handle the big prize."